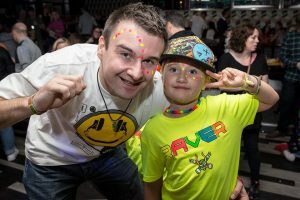 Big Fish Little Fish Award winning Family Rave return to Sunderland! Join us at Independent, 27-28 Holmeside, Sunderland, for our ‘Old Skool and Neon’ themed event. Join our award winning, critically acclaimed family fun event for the post-rave generation of parents – helping them to be responsibly irresponsible since 2013. Our raves are designed to be as much fun for the adults as they are the children, and are social, daft, anarchic and creative spaces for all the family to enjoy. DJ Mudfoot Blaps will play on the multi-sensory dancefloor PLUS DJ Selector C. There is also glitter cannons, balloons, bubbles and giant parachute dance. Craft tables with themed crafts, giant colouring mural and playdoh table. Toddler play area with tents and tunnels and baby chillout space with mats and small ballpool. Licensed bar, free tattoo transfers and glowsticks. Independent is a fantastic venue which is set over two floors. You can enjoying raving on the dancefloor with your children one minute, then pop upstairs to the chill out/play areas the next. Optional (but very much encouraged!) fancy dress: Old Skool and Neon theme -bright colours, dungarees, glitter……. Edinburgh - Hog-Mini ‘All That Glitters’ with Capitol 1212 Family Rave!